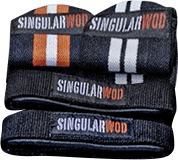 The Singular WOD foam plyometric box or jumping box is especially recommended for exercises such as box jumps, HSPU, burpees over the box and many others which you can now do without fear of painful blows if you miss the jump. The high density foam each box is manufactured with ensure great absorption without losing stability. Its nylon fabric cover is very durable and resistant. Thanks to the Velcro attachment system, you can use each box separately or combine the four heights in each pack together: 15 cm, 30 cm, 45 cm and 60 cm. with a maximum height of 150 cm per kit. Surface area: 0.68 m 2. 3-in-1 plyometric jumping box made from phenolic wood with inner reinforcement. Resistant to infinite jumps and humidity.